Helping YOU make a commitment to YOUR health! The Taylor YMCA offers a wide variety of fitness classes for all of our members. Whether you are a health-seeker trying to get started, looking for a little motivation, or an avid exerciser, we have the classes for you! Schedule available at the Y or online. Group exercise is for ages 14 and up. Get the benefits of traditional floor aerobics along with muscle strengthening and flexibility exercise. Join this class for low impact and high fun! A mix of pilates, dance, yoga and functional training. Combine high-energy activities to increase cardiovascular endurance, agility, speed, strength and flexibility. Add some variety to your cardio routine! This class is a mixed of traditional aerobics with a dose of strength training. Features include a fun, low/mid impact, high-variety workout using the equipment in the Wellness Center. 45 minutes of a calorie torching ride! Cycle your way through different simulated terrains in this 1 hour class set to motivating music. While concentrating on physical health and mental well-being, you will place emphasis on proper alignment, deep stretching, and breathing. This cycle class puts the “pedal to the metal”. Rock on while burning major calories. Recuperative postures are held for longer lengths of time and props are used to support a deep sense of letting go and healing spirit, mind, and body. Mixxed Fit is a people-inspired dance fitness program that is a mix of explosive dance and boot camp toning. Build muscle endurance and strength working all the major muscles groups using a barbell. A mix of yoga and pilates. The core-firming benefits of pilates with the strength and flexibility of yoga. Strength and range of movement benefits are the focus of this class. This class offers modifications, intensity level changes and LOTS of Choreography with a chair, hand-held weights, elastic tubing with handles, and ball. Great for adults with MS, Parkinsons, Fibromyalgia, Arthritis or balance issues. A more intense version of our original SilverSneakers. This class will focus on yoga-moves seated in chairs. Low-impact class with basic footwork and lots of fun! Combines step aerobics with body toning. With bands, hand weights, steps, and any toy we can find to help you become stronger and more powerful! Advanced step class at a faster tempo! This fun and intense total body workout includes strength and cardio exercise that will bring your fitness to a new level and get you ready for the day. Zumba fuses hypnotic Latin rhythms in each class of calorie-burning, heart-racing, muscle-pumping, body-energizing, awe-inspiring movements. 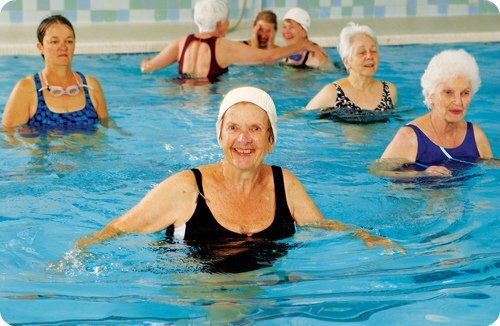 The Arthritis Foundation/YMCA Aquatic program is designed especially for those persons with arthritis. It is also great for individuals beginning an exercise program, rehabilitating from surgery or minor back problems. Add deep water, shallow water, steps, dumb bells, tubing and flotation belts into a circuit training format and you will have one of the best workouts ever! Push yourself for a high- intensity cardio workout, or tone it down for a nice refreshing workout with water resistance and equipment for more challenge. Attain muscle strength and endurance with aerobic exercise without joint impact by using a variety of resistance equipment in the deep end.